Scientists who mapped one of the most enigmatic mountain ranges on Earth have given a first glimpse of their data. An international team spent two months in 2008/9 surveying the Gamburtsevs in Antarctica - a series of peaks totally buried under the ice cap. The group has told a major conference in the US that the hidden mountains are more jagged than previously thought. They are also more linear in shape than the sparse data collected in the past had suggested. This latter finding hints at a possible origin for the mountains whose existence has perplexed scientists for 50 years. "If you have a linear structure it makes them more like the Alps or the Appalachians," explained Dr Michael Studinger from the Lamont-Doherty Earth Observatory (LDEO) of Columbia University, New York. "These are mountain ranges that formed by the collision of tectonic plates." But he stressed that the analysis of the survey data was in its infancy and the team would publish their final assessments in forthcoming papers in the formal scientific literature. Dr Studinger is one of the leading scientists on the AGAP (Antarctica's Gamburtsev Province) project. He has been speaking here at the American Geophysical Union's (AGU) Fall Meeting, the world's largest annual gathering of Earth scientists. The mountains were discovered by a Soviet team during the International Geophysical Year in 1957-8. Their detection was a complete surprise because the rock bed in the middle of the Antarctic continent was assumed to be relatively flat. It led many to speculate that the Gamburtsevs might be old "hot spot" volcanoes that had punched their way through the Earth's crust, much like the Hawaiian islands have done in the middle of the Pacific. The range has since become the subject of intense scientific fascination because it was almost certainly a nucleation point some 30 million years ago for the huge ice sheets now covering Antarctica. Studying them has been immensely difficult, however. Conditions are brutal; temperatures can go below -80C. It was only with the concerted effort organised around International Polar Year in 2007-8 that a full-scale aerogeophysical survey became possible. Two instrumented Twin-Otter aircraft were flown out of remote field camps and collected a range of data. They crisscrossed the hidden peaks, flying a total of 120,000km. They gathered gravity, magnetic and ice thickness information, took radar images of the rock bed and the layers within the ice; and made a map of the ice-sheet's surface with a laser. "We have now reached a point in the data processing that allows us to start scientific work with the data," Dr Studinger told BBC News. The shallowest ice covering the mountains is hundreds of metres thick. 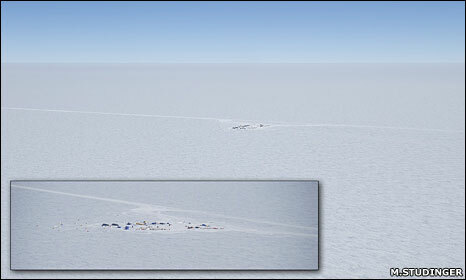 The deepest ice detected is about 4,800m thick. The mountains themselves are standing about 2,500m above sea level. It is now clear the range has a defined linear trend, in contrast to the previously mapped circular feature, and that this trend strikes predominantly to the north-east. The data also reveals a very rugged landscape with high peaks and deeply incised valleys which have been worked in the past by both river and ice processes. "Before we had this data we couldn't see the valleys and therefore we had no way of being able to quantify the role of glacial and fluvial processes which is key to understanding cryosphere and climate evolution," said Dr Fausto Ferraccioli from the British Antarctic Survey. Studying what happened in these valleys could give clues as to how fast the Gamburtsevs became encased in ice. The survey also detected pockets of liquid water at the base of the ice and the team will now try to work out if and how these ponds might be interconnected. "We're seeing evidence of water in the very centre of the ice sheet," said Dr Robin Bell, also from LDEO. "We're really excited about being able to use this dataset to see how valleys that were carved by rivers and then overprinted by glaciers are now driving waters underneath the ice sheet." In addition, Dr Ferraccioli said it was possible a location could be found where ices might be drilled to retrieve information on the ancient climate of Antarctica. "There could be ice that is older than 1.2 million years - somewhere between 1.2 and 1.5 million years," he told BBC News. "We will have to do an analysis of the ice layers. But I think it's going to be quite a challenge because the topography is very rough and the layers are quite buckled." Chinese scientists reported in June the results of survey data they had acquired at the Gamburtsevs. This was, however, just a 30km by 30km square. In the AGAP project, over 20% (one-fifth) of the East Antarctic Ice Sheet was explored.